Published on 17 September 2006. 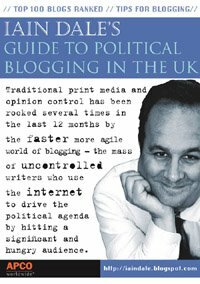 Iain Dale has just finished his latest book, Guide to Political Blogging in the UK (buy here, or download here). It’s a good read, with contributions from Francis Maude (Tory Chairman), Adam Boulton (Sky’s political editor), David Milliband (uber-loyal Blairite minister), and the political editor of the Daily Mail to name but a few. As well as being released to the general public, it’s also going to be distributed at the party conferences to raise awareness of blogs amongst politicians. In one section of the guide, Iain rates the Top 100 Non-Aligned Political Blogs. As you’d expect, Guido quite rightly claims the number one spot. More surprisingly, I’ve somehow parked up at number 29. Just to put that in context, ex-politician and author Jeffrey Archer is at 68, the Daily Mail’s star columnist Melanie Phillips is at 69, and The Times’ David Aaronovitch is at 80. I’m at 29. That’s five places down from the BBC’s Political Editor, Nick Robinson. How the heck did that happen? As if that wasn’t enough, I feature at number 69 in the overall list of political blogs. The 69th best political blog in the country. I think that’s pretty impressive for a medical student with zero political experience writing on a blog where a high proportion of the posts are not remotely related to politics. This 968th post was filed under: Blogging, Book Club, Site Updates. Trackback received at 21:47 on 25th September 2007.